This is the old TAG Spacers page. For the new Red Bat version, CLICK HERE. 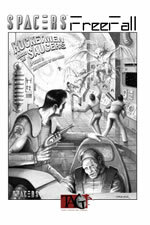 Spacers mixes the old trappings of space opera and a bit more recent knowledge. If you’ve ever wanted to explore the solar system and beyond, fight creepy aliens with ray guns, or command a space-ship speeding through the great unknown, this game is for you. We are on the verge of interstellar travel. The year is 2310 AD and the solar system is teeming with humanity. Science is taking the populations of all the new worlds to heights no one has ever known before, including great zap guns and sleek outfits with finned caps. While we are in contact with alien civilizations, we are threatened by mysterious yet ancient foes. Rocket Ships guard our borders as well as explore where no one has gone before. Part Two of this saga, The Straits of Sublight, is being released on its own as a FreeFall adventure. You can get just the rules here. You can download a character sheet here.